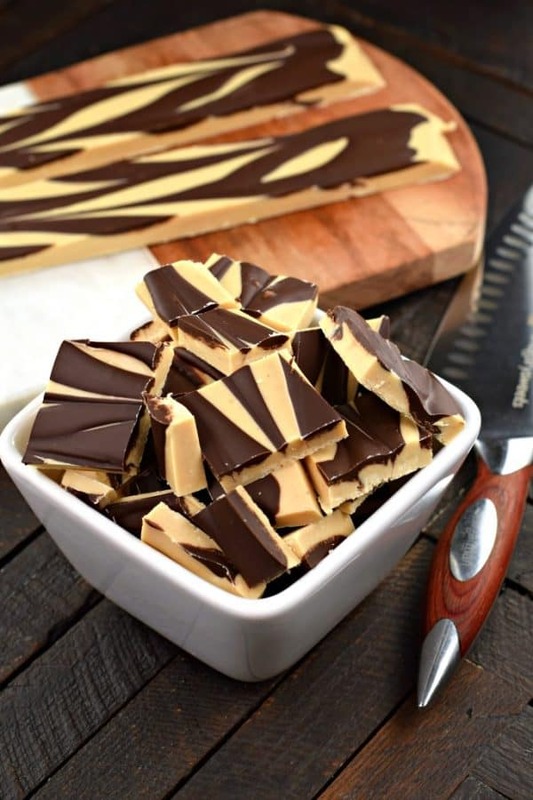 If you’re looking for an easy 3 ingredient fudge recipe, this Tiger Butter is the answer. I don’t know about you, but who doesn’t love peanut butter and chocolate together? Plus, it’s so incredibly easy. All you need is a microwave, a bowl, a baking sheet, and three ingredients. This recipe takes MINUTES to prepare (and will be devoured in minutes too, haha). I first tried this candy years ago while visiting Rocky Mountain Chocolate Factory. Have you been there? They sell some delicious confections, including this tiger butter AND avalanche krispie treats (omg if you haven’t tried those yet, you should). Anyway, as you can see Tiger Butter gets it’s name from the swirls of chocolate and peanut butter resembling tiger stripes! Years ago I made this and added some pretzels to the top. That Peanut Butter Pretzel Fudge still makes it’s way to all my dessert plates during the holidays. So easy, and loved by all! ENJOY! Cherry Bark: you’ll love this easy holiday treat, with only 4 ingredients! Time to stock up on those Cherry M&M’S! I can’t wait to try this 5 ingredient Snickerdoodle Fudge from The Brown Eyed Baker! 5 minutes and 5 ingredients is all you need to make this rich, decadent Chocolate Fudge from Barefeet in the Kitchen! 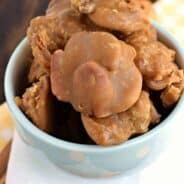 Quite possibly the EASIEST fudge recipe I have ever seen. 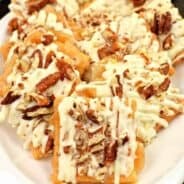 TWO ingredients are all you need for this Coconut Pecan Fudge from Crazy for Crust! Wowza! 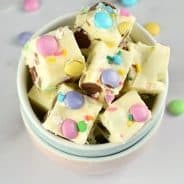 Creamy and soft, this 3 ingredient easy Tiger Butter Fudge recipe is a chocolate peanut butter lover's dream! Make a batch today in just minutes! Melt white chocolate and peanut butter together until creamy. I do this in the microwave. Starting at one minute, stir, add 30 second intervals of heating, then stirring until smooth. 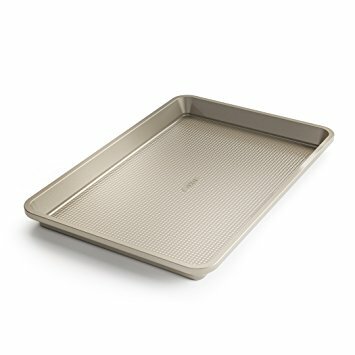 Spread on parchment lined cookie sheet (I use a 15x10x1-inch pan). 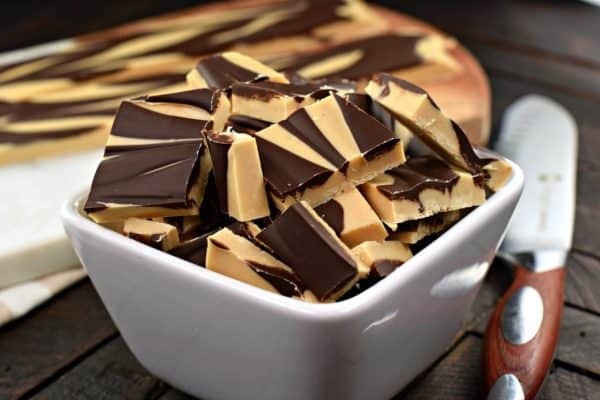 Melt milk chocolate and drizzle over white chocolate. Using knife you pull chocolate so that the two blend together. Allow to cool and set. Cut into squares. Eat and enjoy! This fudge combines my favorite flavors! I will be making this all season! This is sooo cool, great idea and delicious! 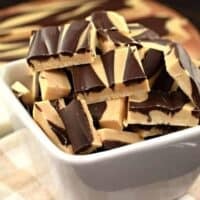 I do love chocolate and peanut butter, and this fudge looks SO good! Gotta try this! 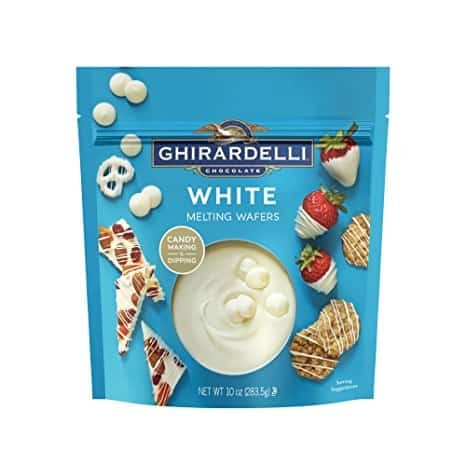 Wow these look delicious! 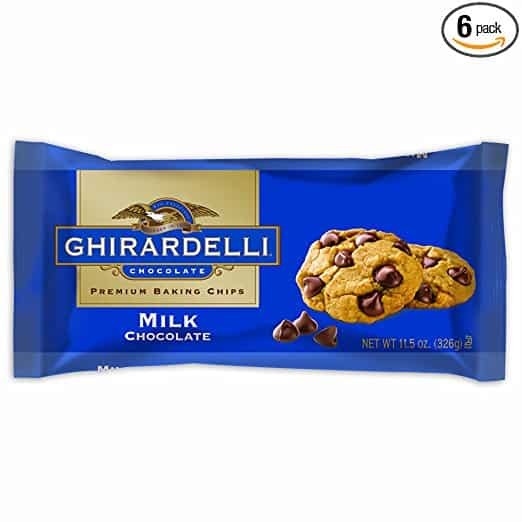 And I love the fact that they only take 3 ingredients! This is like the perfect fudge. I cannot wait to make this for the holidays. I don’t know if I’ve ever seen prettier fudge! It’s gorgeous and I can’t WAIT to eat it! 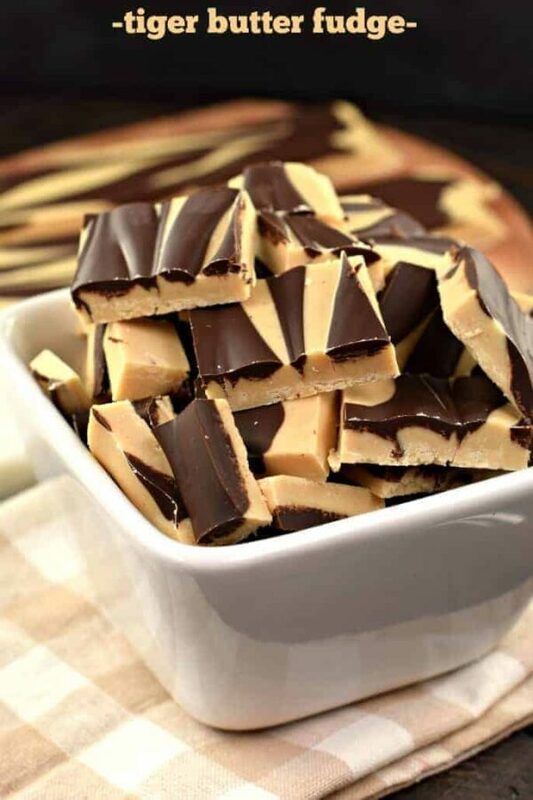 Fudge is such a fun treat especially during the holidays! Peanut butter and chocolate are ALWAYS a winning combination in our house! I adore Tiger Bark. Yours looks better than the one from Rocky Mountain Chocolate Factory… by far!